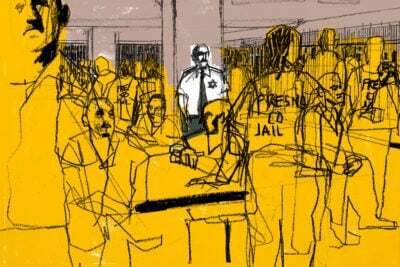 This story originally appeared in “Malofiej 24,” published by the Spanish Chapter of the Society for News Design (SNDE). —attributed to Nathaniel Hawthorne, 1836, quoted in “Low Life” by Luc Sante. It’s a simple line chart, the kind you can make using Excel in about a minute, but for its time it might as well have been from another planet. On Saturday, Sept. 29, 1849, The New York Tribune published on its front page a line chart tracking the deaths in New York City from the cholera epidemic that summer. It used techniques that would become common decades later, but were, for the time being, at the bleeding edge of visual data journalism. And, until now, it was forgotten. The chart is a snapshot of the state of the art of data visualization in news at that moment, and is full of clues that help reveal parts of the hidden history of visual journalism. Mid–19th century New York was a crowded and filthy place, with most of its half million residents packed like sardines into lower Manhattan. Sanitation was inadequate and street cleaning funds were controlled by corrupt city officials. Medical understanding was also primitive, and disease outbreaks were widespread. 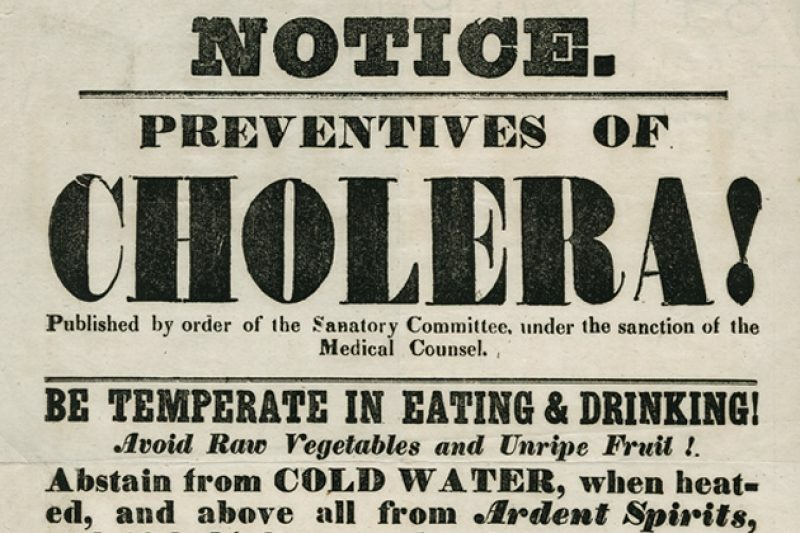 Cholera hit big cities worldwide with terrifying regularity. In New York, an 1832 outbreak killed 3,515 of the city’s then 250,000 residents. Doctors only had a vague idea of what caused the disease. 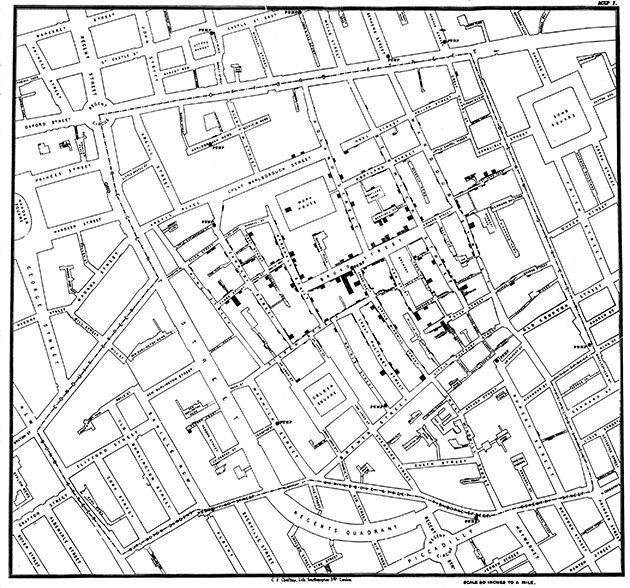 It would take five more years for John Snow to make his famous map of the London cholera outbreak around the Broad Street pump, and another 30 years before Robert Koch linked cholera with the Vibrio cholerae bacterium and medicine began to prevent and halt epidemics. If New Yorkers were still in the dark about what caused the disease, they were all too aware of how fast it killed. The time from first symptoms to death could be 24 hours or less. The 1849 epidemic arrived by ship from Europe after infected passengers escaped a dockside quarantine. Naturally, a new cholera outbreak was big news, and the Tribune was one of the city’s biggest newspapers. Every day, it competed fiercely with other papers for readers, including its archrivals the Sun and the Herald. Gangs of children — “newsboys” — hawked the papers, called collectively the “penny press,” on the city’s streets. My understanding of how this graphic came to be in the paper remains skeletal. I haven’t found any correspondence that mentions it among the papers of the Tribune’s editors. It seems likely that publishing an exotic illustration like this chart would have been a gambit to sell more papers to a populace with an interest in understanding the spread of the disease. Although graphical displays of data were not unheard of in scholarly and engineering books, they were exceedingly rare in U.S. newspapers of that time. Maps became common during the U.S. Civil War in the 1860s, but in the 1840s, illustrations of any kind (let alone data visualization) were rare. I’ve spent the past few years studying the history of data visualization in news. I have seen hundreds of examples of data displays in antique newspapers. 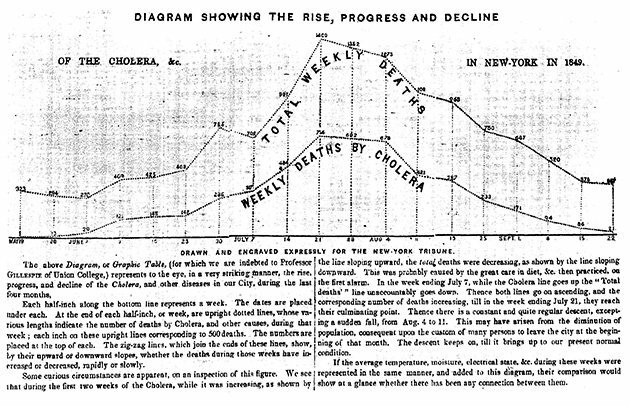 Few have struck me as much as the cholera chart has. It is rare almost to the point of anachronism. There are a few reasons why. First, the technology to reproduce such things was still primitive. Newspapers were typeset by hand, letter by letter. Illustrations and line art had to be carved by hand into small wooden blocks. Bigger illustrations were made by bolting several blocks together (if you look at the cholera chart closely, you can see some of the seams between the blocks). The process was laborious and hard to pull off on the daily deadline of a newspaper. It took great skill and there were only a handful of craftsmen who could do the work. Few if any newspapers had on-staff engravers, so it’s likely the Tribune would have had to bring in somebody with rare skills who could command a high fee. The work also had to be done quickly. The chart includes data from a week before it was published. A bigger obstacle than the production difficulties was the Tribune’s readers themselves. It is unlikely that everyday New Yorkers in the 1840s would have been familiar with statistical graphics, and they likely wouldn’t have had any idea how to read or interpret them. At either end of the annotation are interesting clues. At the beginning, the editors credit the creator of the graphic, or at least the person who suggested it to them. “We are indebted to Professor Gillespie of Union College”. Gillespie was a professor of civil engineering and mathematics at the college in Schenectady, New York. Gillespie’s papers are not collected anywhere, and I cannot find any mention of him in the various Tribune archives, so it’s unclear what role he played. Bylines were not yet conventional in newspapers, but it seems likely to me that he was the creator of the drawing on which the engraving was made. As a scholar, Gillespie would have had access to William Playfair’s books, and been familiar with statistical graphics. If the average temperature, moisture, electrical state, etc. during these weeks were represented in the same manner, and added to this diagram, their comparison would show at a glance whether there has been any connection between them. The Tribune graphic is a snapshot in miniature of a standard yet to come, revealing a growing sense of awareness of the potential for well-designed information displays to help people understand and solve problems. And it has important lessons to teach us more than 166 years later. The first, perhaps, is that the history of data journalism is far older than many people realize. Newspapers were publishing data on commodities prices, cargo shipments and births and deaths since their very beginning. 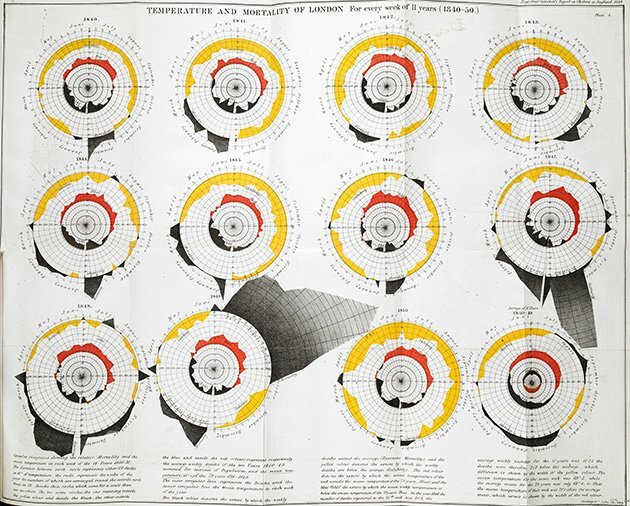 Data visualization in newspapers wasn’t common until technical advances later in the 19th century made it easier, but even as far back as the 1840s newspapers were experimenting with it. Polar area charts plotting mean temperature vs. mortality in London, 1840-50, by William Farr, from his study on the mortality of cholera in England. As visual journalists, we ought to feel a kinship with the unknown engraver of this cholera chart. We may think we inherit our craft from people like Snow and Playfair, but they were essentially scholars, with motivations, resources and limitations far different than ours as journalists. In reality, we stand on the shoulders of the people who toiled over maps and charts like our cholera chart, with imperfect data, on deadline, for newspapers. But the most important lesson is that there is no such thing as an innately intuitive graphic. None of us are born literate in a reading visualizations. But a mid–19th century newspaper reader, like any of us, was born with the potential to understand one. The Tribune of 1849 couldn’t assume its readers would understand a line chart, but they clearly thought it was worth trying. The implications of this are significant. First, we must always keep our readers in mind. They have the potential to understand our graphics, but we must never assume our graphics are intuitive, without the need for explanations or directions. Visual and narrative clues about how to read them are vital and mandatory. 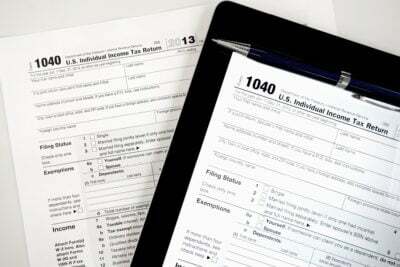 On the other hand, this also means we are not trapped into using simple forms. There is no pure set of visual types that conform to human nature and are thus are intrinsically better than the others. We are free to experiment. If we keep our readers in mind, we can pursue new forms that delight them and help shed light on complex subjects in ways that have never been tried before. For the right story, our readers will put in the time necessary to understand even strange new graphical forms — like our line chart must have seemed in 1849 — if we only take the time to help them do so.